The fresh peach pie was a hit! The pie was a huge success! The cream cheese/sour cream filling, I think, came really, really close to the original’s texture and flavor. 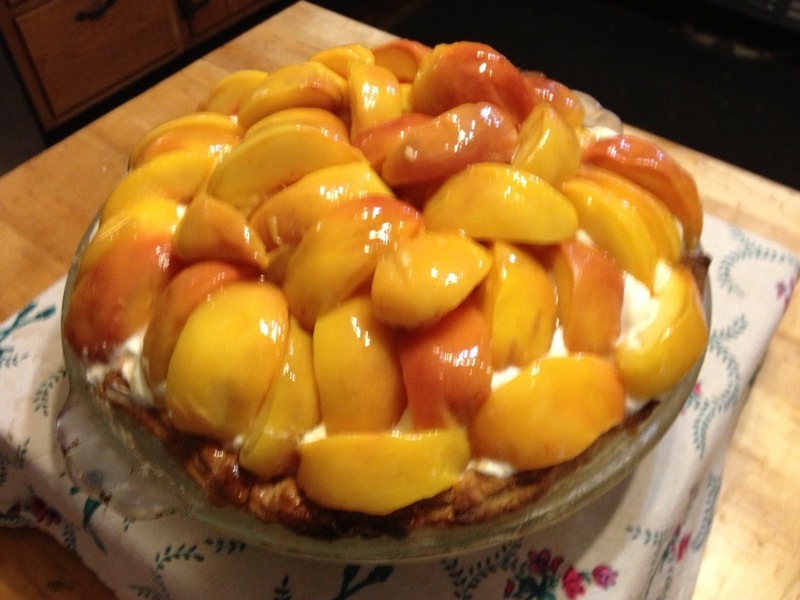 Mine was thick and firm, it had a nice touch of zing to compliment the sweetness and the vanilla bouquet and then you have the peaches themselves, they held their own beautifully against the creamy filling and the pie crust was nice and flaky, not sweet but a nice counterpoint for the sweetness of both the peach and the cream cheese/sour cream filling. It makes me so happy whenever I bake something and my family loves it. It makes all the work, the waiting, the cleaning up worth it and it makes me want to do more. I am sure that every baker, every patissier just wants to feed people sweet things and see them smile. Just like for any chef or cook, who loves to see clean plates, full bellies and happy faces, that feeling is addictive. The feeling that the fruits of your labors gave others delight and pleasure, it is one of those “it doesn’t get better than that” moments. Get back to that novel -ha! It was as good as it looks, definitely a keeper as a dessert recipe. Of course it was! It looks amazing. I am quite proud of my pie, one of the few desserts that looked very pretty. It did taste realy good, it’s all gone now.